Let the dough rest at room temperature for about three hours (under an inverted mixing bowl. Add all the spices and lemon juice to this and boil together. Leave the syrup to cool in the fridge overnight. Cut each of these strip into 3 strips and make a twist like a hair twist, and pinch together the end. Deep fry in hot oil, within 3 minutes in low temperature just enough to brown the dough. Once cook, drain it quickly. And add the syrup. 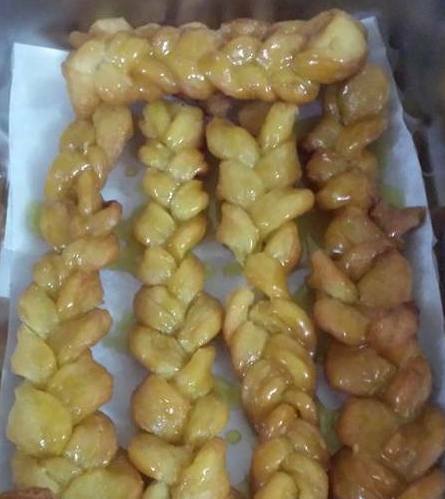 ( The secret is make the syrup so cold while the koeksisters hot this way it will draw enough syrup.